Yesterday was a beautiful sunny day, warm at last! 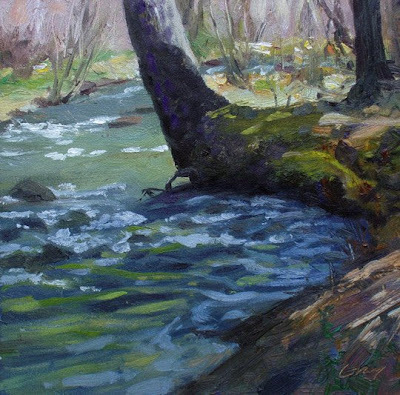 I headed for the mountains and spent an enjoyable afternoon doing some plein air painting alongside this purling stream. The snow up high is melting fast, giving the silt-filled water a lovely milky blue-green color. Are the black flies the little biters? Fortunately we don't have them here. Mosquitoes, bees, yellowjackets, houseflies and the occasional horse fly, but no black flies. Thanks for coming by Martha. What a great little spot to set up and paint. Love the pattern of light and shadow in this one Don. I can almost hear the rushing water. Bet it is cold. you are SO lucky to have such a rich environment around you! I just LOVE the bright green moss on this one! Thanks, Frank. It was so great painting directly from nature (as you well know.) I'm pretty rusty, though, after a winter in the studio. The day was nice (in the high 60's) but that snowmelt water was cold indeed! Thanks, Holly. It is interesting country here. A lot of variety in the region, from alpine forested mountains, to farmlands, to sage-covered rolling hills. I've never been in Massachusetts, but would love to go sometime. Your paintings show that it's beautiful country there too. Thanks for visiting, Rob. I enjoy your blogs as well.